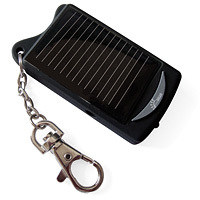 While your keys won’t require batteries at this point in time, it is interesting to note that the Solar Keychain is able to store up excess energy harnessed from the sun so that your cell phone’s battery can remain juiced should you require to talk longer than usual. Simply dangle this ultra-slim device from your keyring and you’ll have emergency power for your phone 24/7, wherever you may roam. Unless of course you leave your keys at home, in which case you’ll be in double trouble. Using the Solar Keychain is lemon squeezy. Simply plug it into your mobile using the relevant adaptor (loads included) and gawp in planet-hugging amazement as it pumps in around 15-25 minutes of extra talktime. That’s more than enough time to order a cab, talk vindaloo with the bloke down the curry house and send a few ‘ooh, me ‘ead’ style texts from the back of the taxi. It will take approximately 10 hours for a full charge, so make sure you remember where you place the Solar Keychain before you head home from work lest you need to dig up a crowbar to break inside your home. Oh, and the Solar Keychain’s usefulness is not limited to just cell phones as it works with any other device that charges via USB as well. Available from Firebox for £14.95.